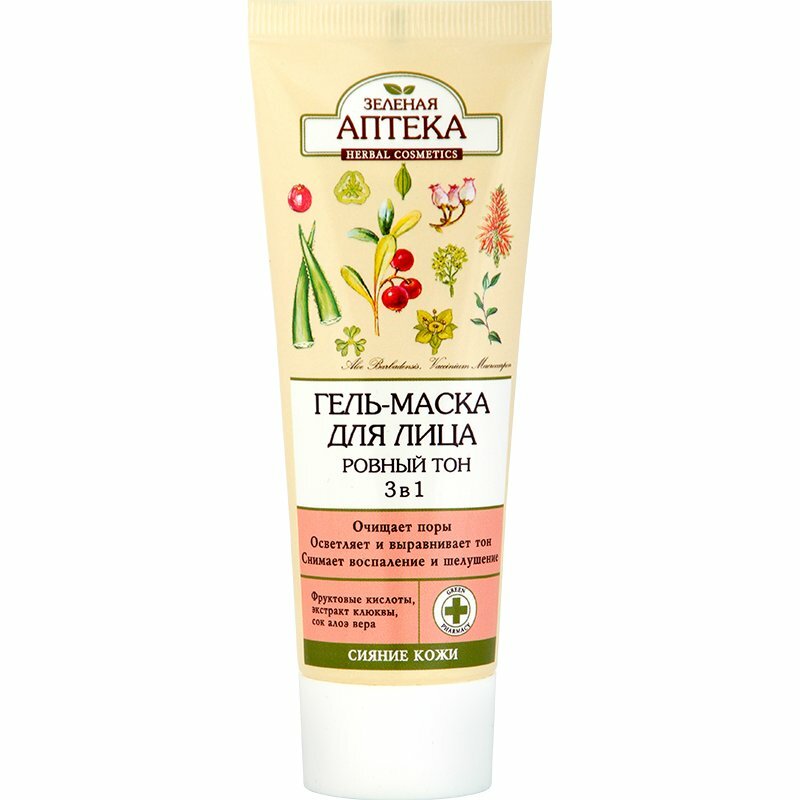 Ukrainian beauty brand Green Pharmacy presents Healthy Complextion 3-in-1 Gel Face Mask. The product cleansers pores, improves complexion, relieves irritated and flaky skin. It is formulated with AHA fruit acid complex, cranberry extract, and aloe vera leaf juice. This gel face mask by Green Pharmacy contains malic acid, citric acid, tartaric acid, glycolic acid, and lactic acid. They produce a deep cleansing and exfoliating effect on the skin, help to rid it of toxins, and stimulate collagen synthesis. Cranberry extract contained in the mask improves complexion, prevents hyperpigmentation, and produces a toning effect. Aloe vera leaf juice is valued for its pronounced hydrating properties. It deeply moisturises the skin, helps to retain moisture, and has a soothing effect. Directions. Apply to the clean skin of your face and neck several times a week. Leave until completely dry, massage for about 30 seconds, rinse thoroughly with warm water. Ingredients. Aqua, Glycolic Acid, Lactic Acid, Citric Acid, Tartaric Acid, Malic Acid, Glycerin, Xanthan Gum, PEG-8, Aloe Barbadensis Leaf Juice, Hydroxyethyl Urea, Urea, Vaccinium Macrocarpon Fruit Extract, PEG-40 Hydrogenated Castor Oil, Ammonium Acryloyldimethyltaurate/VP Copolymer, Parfum, Propylene Glycol, Sodium Hydroxide, Phenoxyethanol, Ethylhexylglycerin, Potassium Sorbate, Sodium Benzoate. Want to buy Healthy Complextion 3-in-1 Gel Face Mask? Call us or submit your order via our web site!